Rudbeckia hirta 'Indian Summer' is a classic Black-Eyed Susan with large flowers up t0 9" wide. They have golden-yellow petals that radiate outward from a small, brown cone. It's like a ray of sunshine in the garden. Rudbeckia 'Indian Summer' makes a fantastic, long-lasting cut flower. In the garden, it looks good with many perennials, annuals and ornamental grasses. 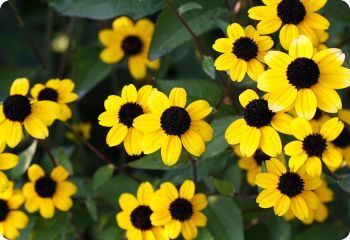 Indian Summer rudbeckia is a tall, vigorous variety that blooms quickly from seed. It keeps going until late autumn. It was an All-America Selections winner in 1995. It was given the Award of Garden Merit by the Royal Horticultural Society in 2000. Rudbeckia hirta is a North American native wildflower. It is a host plant for Painted Lady and Silvery Checkerspot butterfly larvae. Hardy biennial in zones 4-9. It can be grown as a self-sowing annual elsewhere. Rudbeckia is a genus consisting of perennial, biennial and annual plants with daisy-like flowers in shades of yellow, gold, orange and mahogany red. Start rudbeckia seeds indoors 8 weeks before the last frost date. Barely cover the seeds with soil. Full sun to part shade. Some species require stratification. Rudbeckia hirta 'Cherry Brandy' is an exciting new selection with maroon-red flowers that have contrasting dark centers. I am impressed with the quality and abundance of the blooms. Cherry Brandy rudbeckia is shorter than Indian Summer rudbeckia, so plant it closer to the front of the border. Deer resistant. Hardy biennial in zones 4-9. Rudbeckia hirta 'Marmalade' is a dwarf Black-Eyed Susan with 5" flowers in a warm golden-orange color. Marmalade rudbeckia is a good choice for large containers or the front of the border. Also known as Gloriosa Daisy. Hardy biennial in zones 4-9. 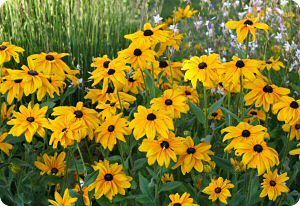 Rudbeckia hirta 'Rustic Dwarfs Mix' is a mid-height Black-Eyed Susan with flowers in shades of gold, bronze and mahogany red with dark central cones. Rustic Dwarfs rudbeckia is stunning in beds and borders, and it makes an excellent cut flower. Half-hardy perennial, best grown as an annual. Rudbeckia subtomentosa is a native perennial found throughout the central United States. It blooms for many weeks from August to October. 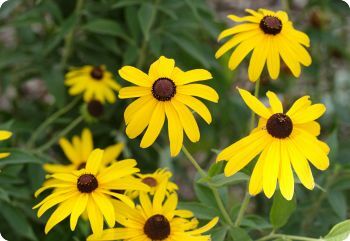 The 3" butter-yellow flowers have dark brown centers and a sweet, anise-like fragrance. Rudbeckia subtomentosa is a long-lived perennial that tolerates a wide range of conditions from moist to dry soil, including clay, and full sun to part shade. It looks nice near the back of the border, wildflower garden or cottage garden. Rudbeckia subtomentosa attracts many different beneficial insects, including a variety of native bees, syrphid flies, tachinid flies, parasitic wasps, beetles and butterflies. In the fall, goldfinches feed on the seeds. Also known as Sweet Coneflower and Fragrant Coneflower. Requires 6 weeks cold-moist stratification. Hardy in zones 3-8. Rudbeckia triloba is a native wildflower that is found in many states throughout North America. In late summer to fall, it is absolutely smothered in small, yellow daisies with black centers. Rudbeckia triloba is a tall, eye-catching perennial that makes a terrific companion plant for ornamental grasses. If desired, you can cut the plants back in mid summer to encourage shorter, bushier growth and later blooming. Also known as Brown-Eyed Susan. Drought tolerant. Requires 3 months cold-moist stratification. Can be sown outdoors in the fall. Hardy in zones 3-9.